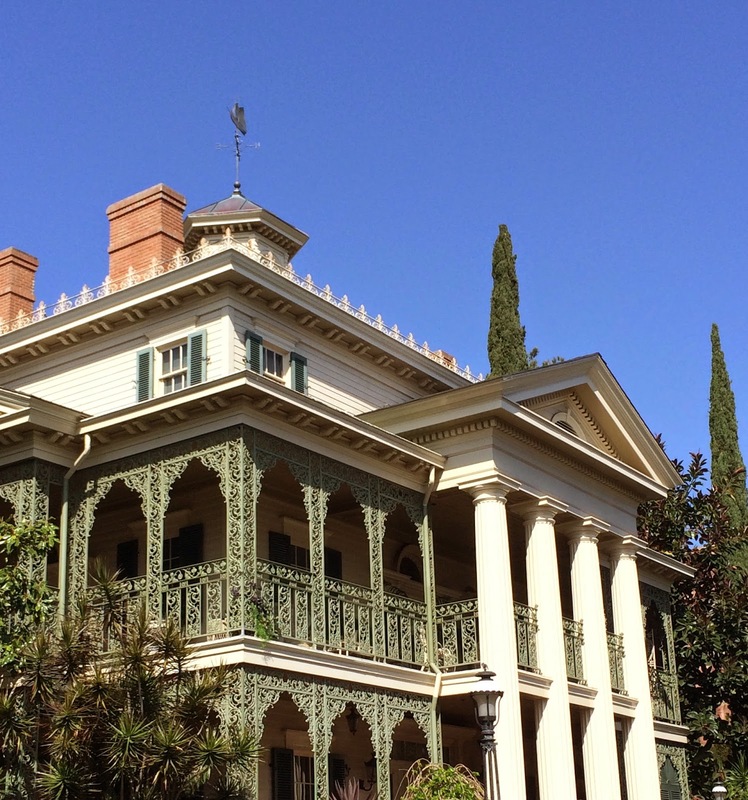 A Dole Whip A Day: Taking Your Little One to the Happiest Place on Earth! Taking Your Little One to the Happiest Place on Earth! Now that I have a (long-awaited) little one, I have started thinking about his first trip to Disneyland…and reading other people’s opinions on various pages and sites on taking babies and toddlers to the Disneyland Resort. My hubby and I decided to skip this summer, as we know that the “happiest place on earth” can also be one of the germiest places on earth. And, with our son being born a preemie, we decided that we will take our first family Disneyland trip when our little one is just shy of a year and a half. I read lots of comments such as “Little guys won’t remember the trip when they are older, save your money!”, “It’s too hard to manage baby needs in the park!”, “Are there even any good rides that babies can go on?” Now reading this kind of commentary from others should have deterred our decision. I’m sure it would deter many. But, as I like to consider myself an unofficial expert, I know I can tackle it! So, here are my responses to the most commonly heard reasons not to take little ones into the park, and a few separate helpful tips and tricks! No, this one won’t work for me. For starters, little ones ages 2 and under get in for free, and you can bring as many snacks into the parks as you’d like. The additional cost of bringing in a baby or toddler can be quite negligible, if you know how to plan well. Besides that, who says that I’m only going for the sake of my little boy’s memories? When his eyes get huge seeing Mickey for the first time (or he freaks out and starts to scream…either way), when he runs through the castle, when he wants to ride the carousel again and again, those are memories for me. I am there for his current happiness and my memories. Not to mention stories and photos that can be shared for years to come. That is a special kind of magic that I don’t want to miss. It is hard…I’m finding it’s hard anywhere. But again, you can bring baby’s food and snacks. You can put extra changes of clothes and diapers (beyond what, I’m sure, is already in your backpack) in a locker. There are changing stations in NEARLY EVERY restroom in the parks, in addition to family restrooms. In addition, there are Baby Care Centers in both Disneyland and DCA. What’s there, you ask? Nursing rooms, changing tables, kitchens with microwave and sink access, little tiny toilets for those who are potty training, and a shop offering everything you may have forgotten or run out of: formula, diapers, wipes, sunscreens, pacifiers, and baby meds. 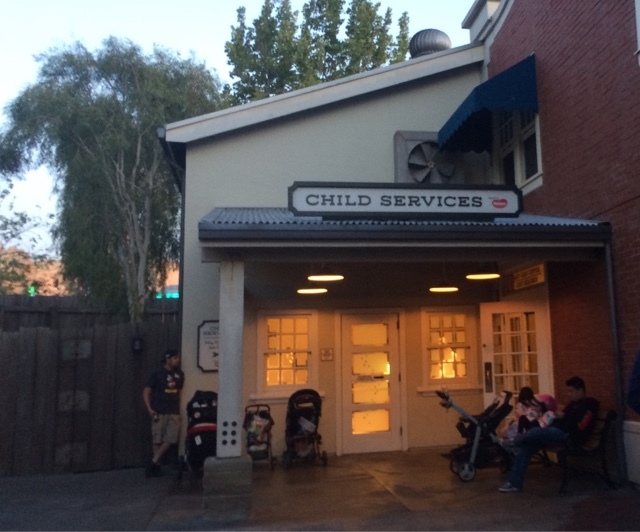 In Disneyland, the Baby Care Center is located at the end of Main Street, next to First Aid and near the Corn Dog Wagon. In DCA, it’s in Pacific Wharf, next to Ghiradellis. I hate the notion of “good rides” vs. “baby rides.” It goes against everything that Disney intended when he built Disneyland. But, for those who don’t think littles have any rides for them, let me tell you: THERE ARE TONS! Any ride without a height requirement is available for babies and toddlers. In Disneyland alone, this includes (I know I may be forgetting some) the following: Pirates of the Caribbean, Haunted Mansion, Jungle Cruise, Tiki Room, Peter Pan’s Flight, Mr. Toad’s Wild Ride, Snow White, Pinocchio, King Arthur’s Carousel, Teacups, Alice in Wonderland, Dumbo, Casey Jr., Storybook Land, It's a Small World, Mark Twain and the Columbia, Finding Nemo Submarines, Tom Sawyer’s Island, Roger Rabbit, Buzz Lightyear Astro Blasters, Astro Orbiters, Winnie the Pooh, and the Disneyland Railroad. And all of these don’t include any of the shows, parades, fireworks, storytimes, character houses and meet and greets, or anything at DCA! There is so much to do! Don’t push your baby to skip naps or stay until park closing…Sure fire way for a meltdown! Work in a quiet place for you little guy to rest either at the parks (the waiting area in the Animation Academy is amazing for this!) or back at the hotel. If you don’t think your toddler can handle long lines, there are plenty of websites that offer crowd calendars for you to check out. Less crowded = shorter lines! Don’t trust the crowd calendars? Go to the Disneyland website and look at park hours. If the park opens at 8am and closes and midnight, guess what: It’s going to be crowded! Don’t want to miss Radiator Springs Racers? Love Splash Mountain? Utilize the Rider Switch feature! 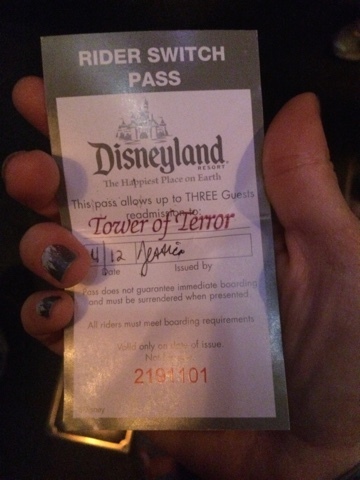 Before you get in line, get a Rider Switch pass from a cast member. Then you get in line and go on the ride. When you are done, hand your pass to the person waiting you’re your kiddo, and they can now get into the FastPass line to take their turn…They can even bring two people with them! This does not have to be redeemed during a certain chunk of time like a FastPass...bring the pass back whenever you're ready to use it! NOTE: As with many “we’re here to help” features that Disney parks have offered, people have taken advantage of this. 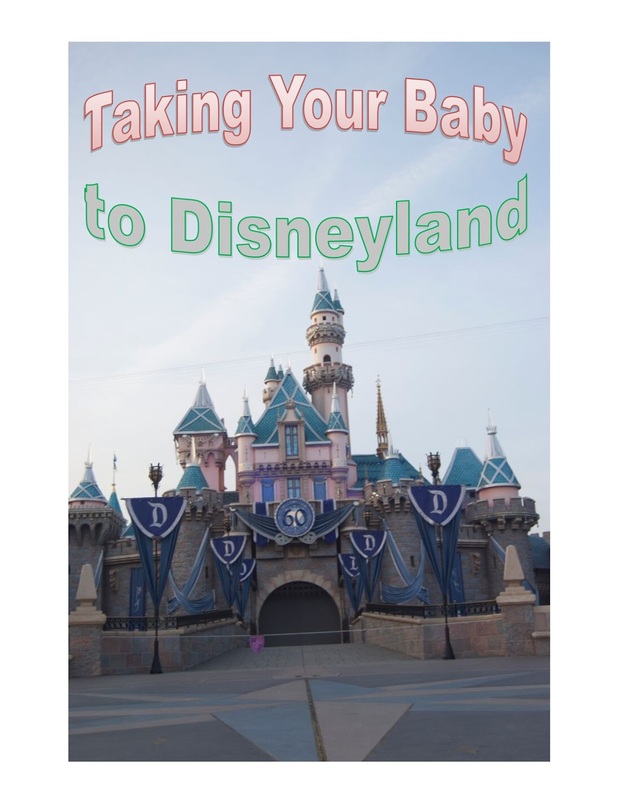 So, many cast members ask to see your baby with you before giving the pass to you. They are not being rude, they are doing their job. Be nice to cast members, everyone! You can rent a stroller or bring your own. I HIGHLY suggest customizing your stroller with something easy to spot: ribbon, decorative duct tape, etc. People say that their strollers have been stolen, and most of the time, it ends up being that many people bring in the same brand of stroller and take the wrong one accidentally. Now, I must say, I am amazed by all of the stroller debates I have read on Disney pages. So let’s break it down to common courtesy: Families may bring strollers into the park, I don’t care how many people want to petition that they shouldn’t be allowed in. That's ridiculous. If you have a stroller with you, watch out for people’s feet and, keep in mind, that room for a small person to squeeze in does not equal room for a double-wide stroller to fit in. Wait your turn. If you don’t have a stroller, let the families with strollers take their turn! Don’t jump in front of them or try to climb over someone’s stroller. 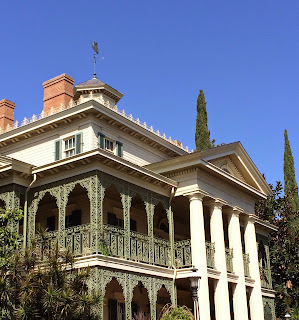 (The other half of Dole Whip a Day has literally had people climb over their stroller - RUDE!) If you do that, don’t complain if the family with the stroller has the audacity to try to move and your foot gets in the way. Be kind and courteous, everyone! So, that’s it! Am I going to take my little boy as a toddler? Yup! Are we going to have a great time? Yup! Am I being a little naïve? Maybe, but I don’t care! My hubby and I will figure it out and can’t wait to share the Disney magic with our awesome little guy! What tips/tricks do you use when taking little ones into the park? Let us know in the comments below!